Dental injuries and infection can make it very difficult to live every day to the fullest. Thankfully, Santavicca Dental Professionals is here to provide the compassionate and unhurried care patients need for these common problems. We offer several restorative services that can rejuvenate your smile’s strength, function, and overall structure in ways that exceed expectations, whether the damage is relatively minor or extensive in nature. If you have any questions or concerns, please don’t hesitate to contact our Lebanon, NH dental office for more information. Do you have a tooth that’s injured or incomplete? 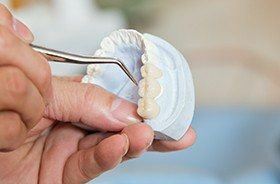 Have you lost one or more natural teeth altogether? Let our doctors assist you with a brand-new restoration that’s painstakingly customized to match your unique smile. Dental crowns are recommended for rebuilding the natural shape and feel of teeth while also preserving the structure that remains. Meanwhile, bridges can fill in the space left by one missing tooth or multiple teeth in a row. These options can be crafted from multiple kinds of materials, including tooth-colored dental ceramics and traditional cast gold. Did you know that over 90% of the United States population will experience a cavity at one point or another? Although our team strives to prevent this type of damage in the first place, we also have a tried-and-true solution waiting in the wings for rebuilding a tooth as soon as possible: tooth-colored fillings. 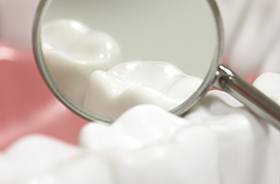 Unlike traditional amalgam/silver, tooth-colored fillings contain NO metal and are extremely natural-looking once in place. They also directly bond with the tooth enamel, which results in healthier, longer-lasting improvements. Sometimes, speed is our patients’ top priority when they are in need of a new dental crown or similar restorative solution for a damaged tooth. 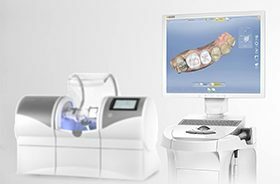 Thankfully, our team is happy to provide an extremely efficient care process while still maintaining a high level of quality with the help of CEREC. This technology helps us complete the creation of a brand-new, custom-made dental restoration in one simple appointment – no temporaries or uncomfortable putty impressions required.